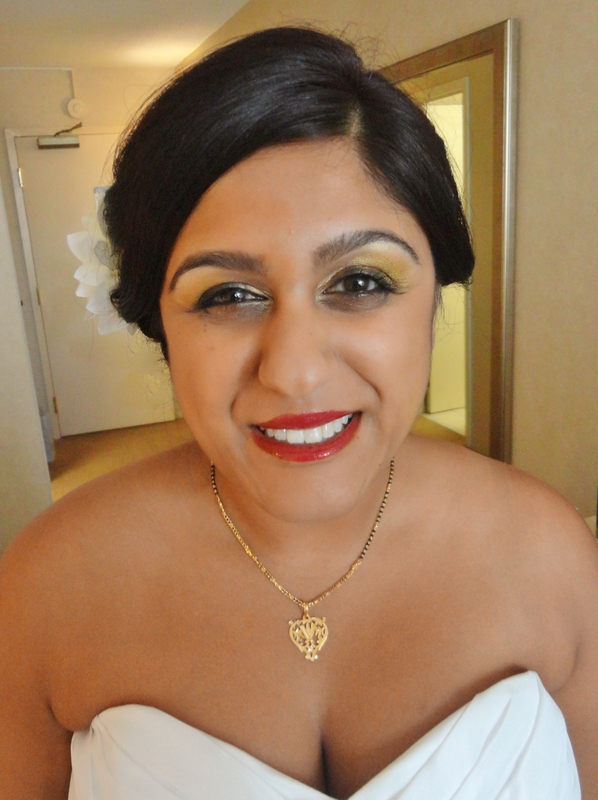 Today I got to spend the day with beautiful bride Priya. Last she and I met was back in May during the trial run of her hair and makeup. We discussed two different hair styles. One to be worn for the first half of the day while wearing her Sari and another when she changed into an American style wedding gown. 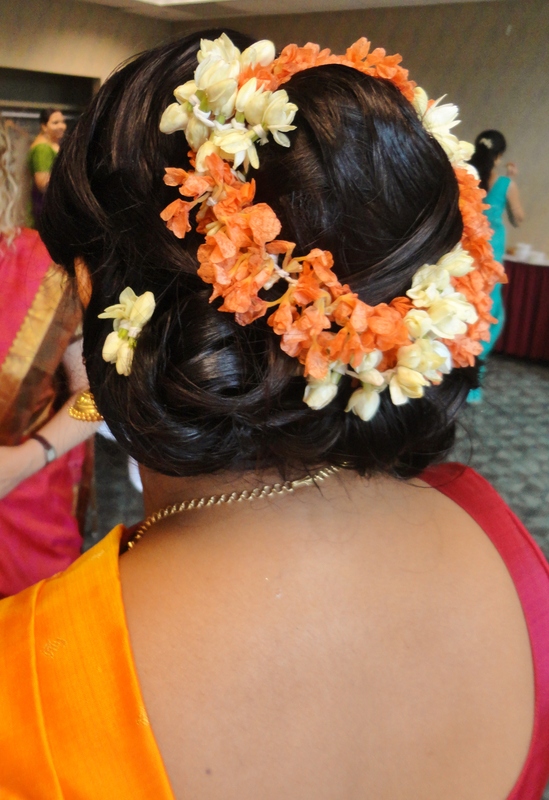 The first style for today was for her traditional Hindu ceremony and she would need a center part for her Tikka. 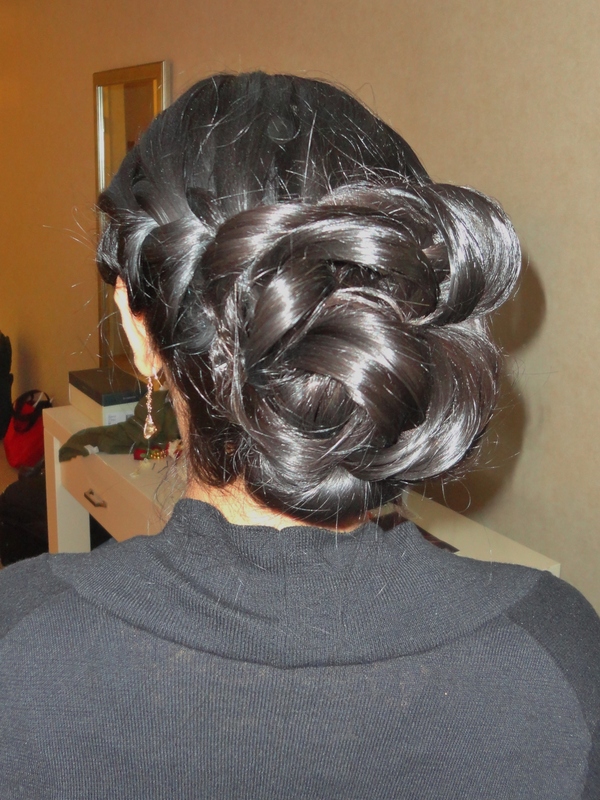 Then I created a bun in the center back. 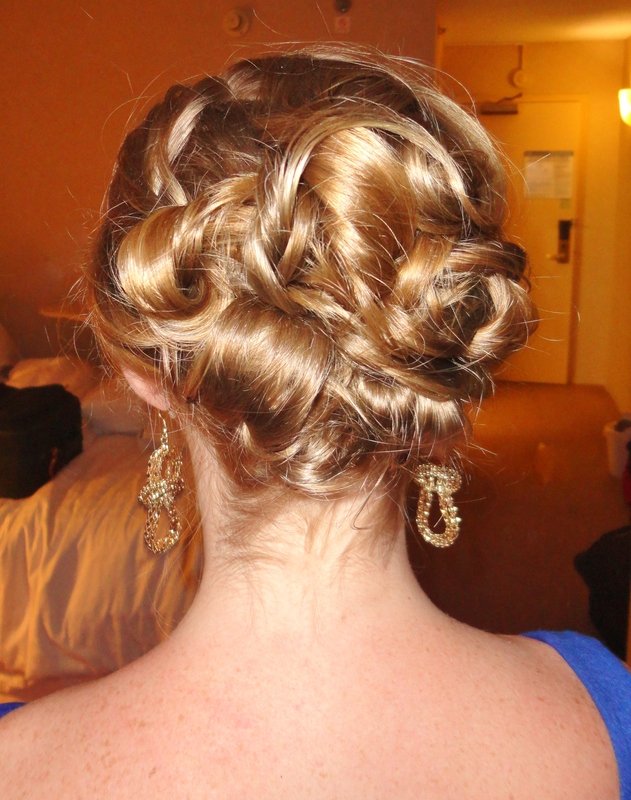 At the base of her hair I weaved a mass of curls. To finish the look I used two different ropes of flowers and wrapped them through the hair. 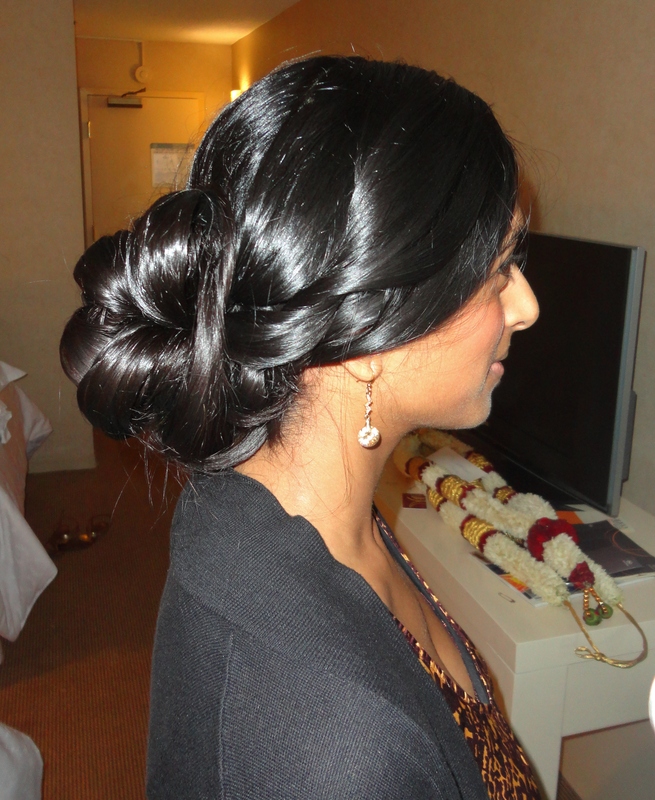 I also got the pleasure of styling for couple of Priya’s relatives today also. 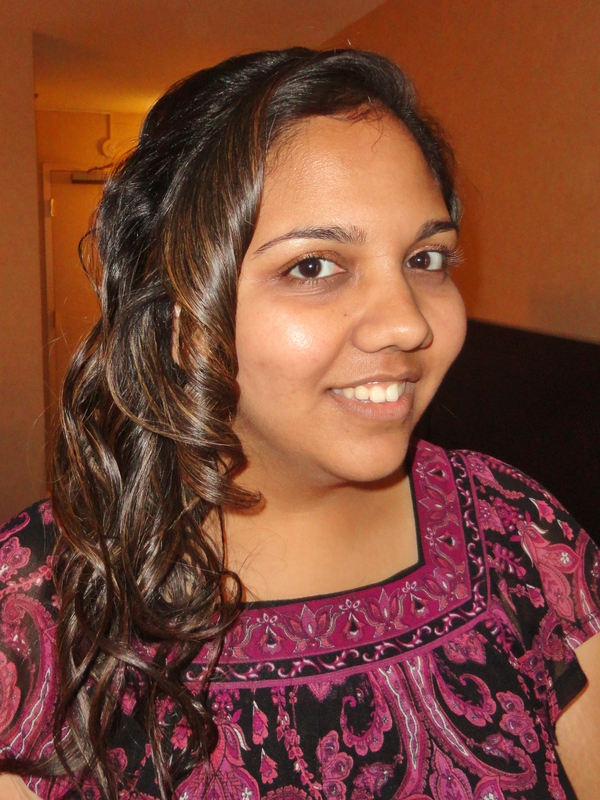 Sangeetha, her cousin from Delaware, wanted to leave her hair down in long wavy curls. I pulled one side back slightly and made a little twist. 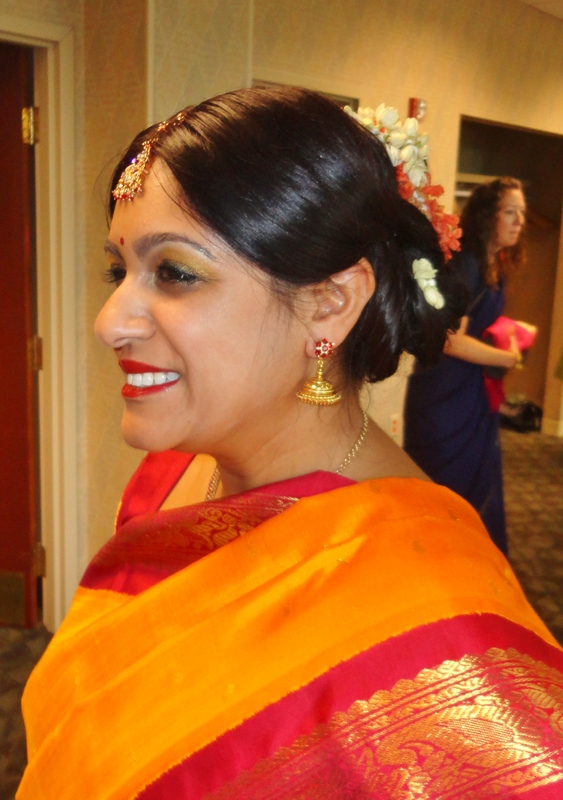 Next was another cousin, Rupa. She decided to wear all of her long thick hair up and to the side. 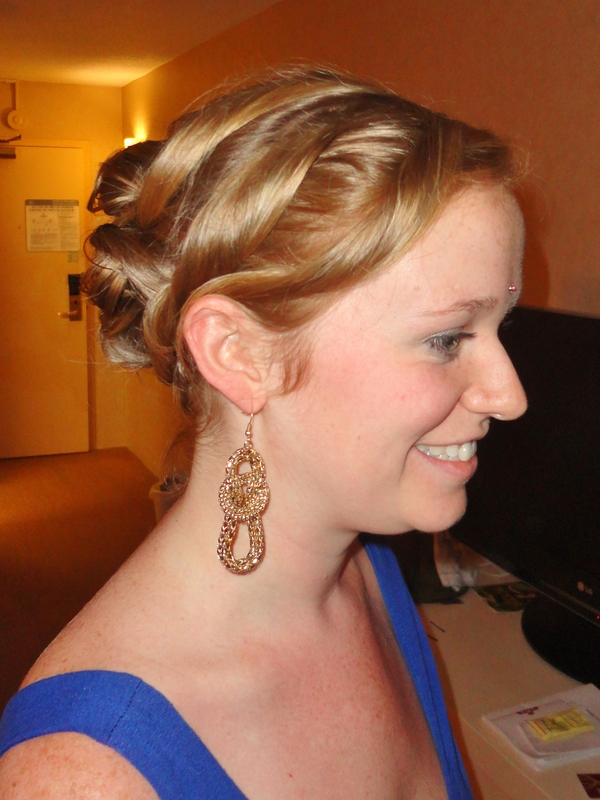 I also braided one side of her hair over to the updo. The sister of the groom Ariel, was also to be styled today. She wears her her in a shorter bob-like style. So I curled all of the hair with a large iron and then wrapped the curls around each other. Pinning them togetherat the back of her head to make at up do. 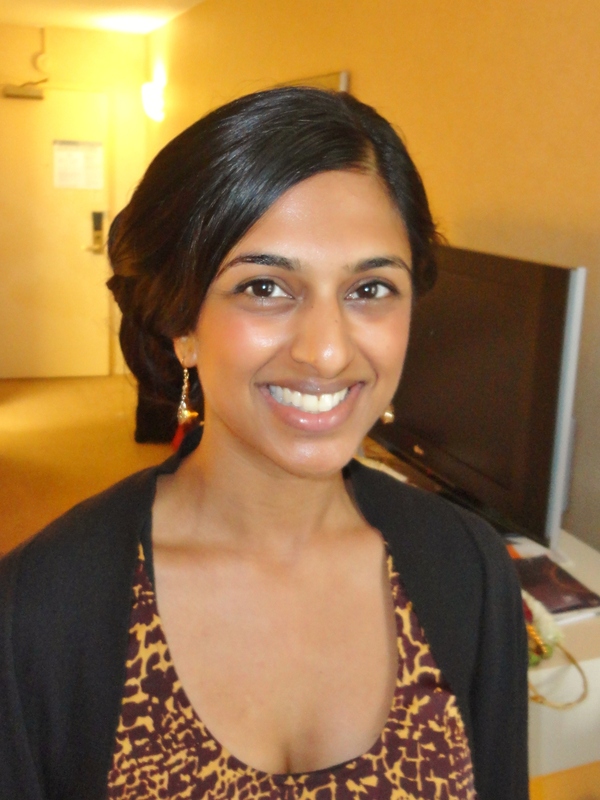 For the reception, Priya changed into her American style dress. I changed her hair into a side parted updo. 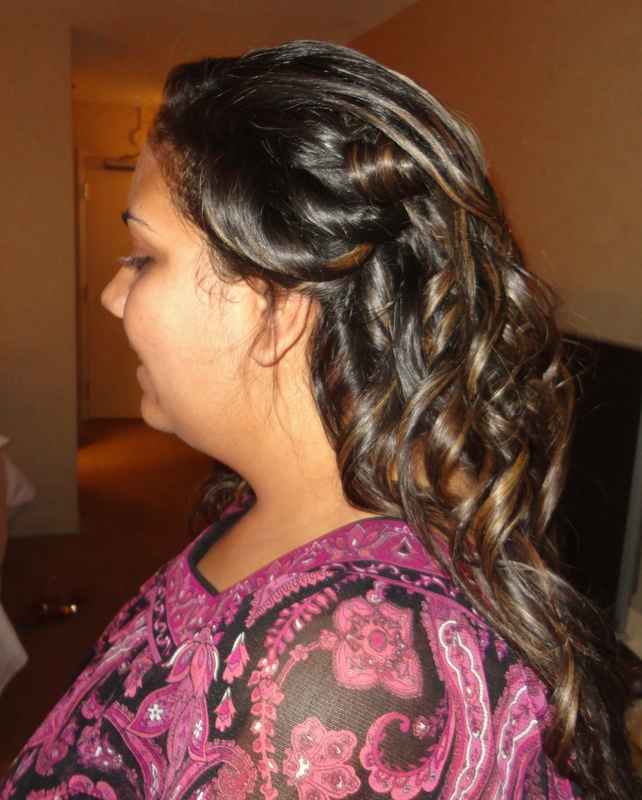 Pulled all of her hair to the right, twisting and weaving it creating a textured look. 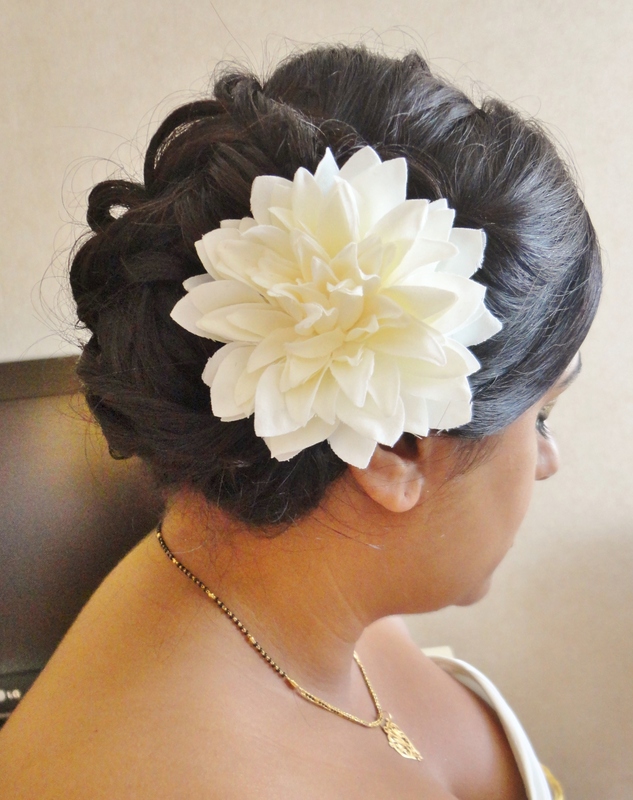 Finishing the style with a large ivory flower. It was a really beautiful, busy day and I am glad to have been a part of it. Congratulations to Jeremy and Priya! thank you again for letting me be a small part of your big day! I am pumped to announce that in August I get to be a part of Priya’s Pittsburgh wedding! 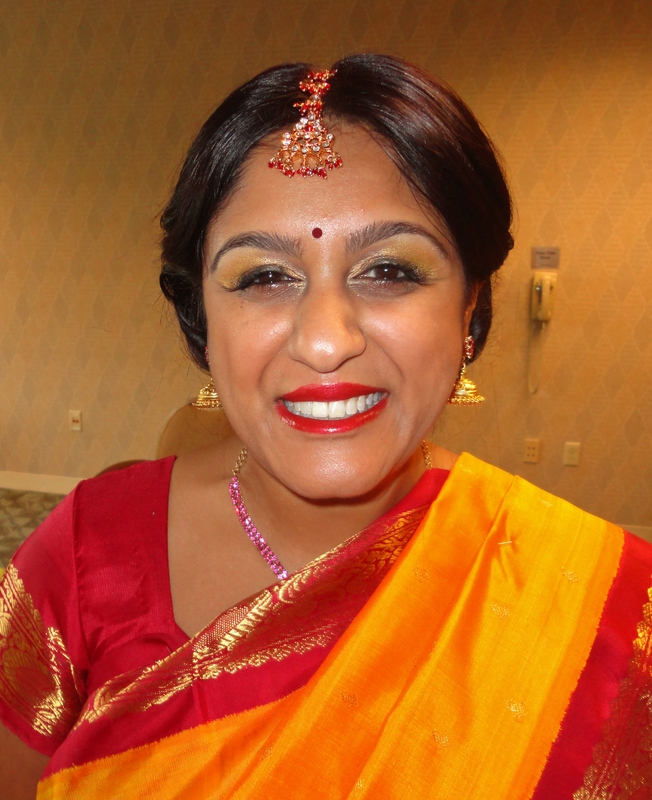 Priya is having a traditional Hindu ceremony in the morning and will be changing her look completely for the reception later that evening in the South Side. I am looking forward to seeing the looks that she is thinking about and also styling for her mother and soon to be sister-in-law. Congratulations once again to Priya and thanks for letting me be a part of the day!